T-shirt printing is all about moving with the times and adopting the latest advancements the industry has to offer, and in Dublin, the T-shirt Company are no different to our counterparts anywhere else in this T-shirt mad world. 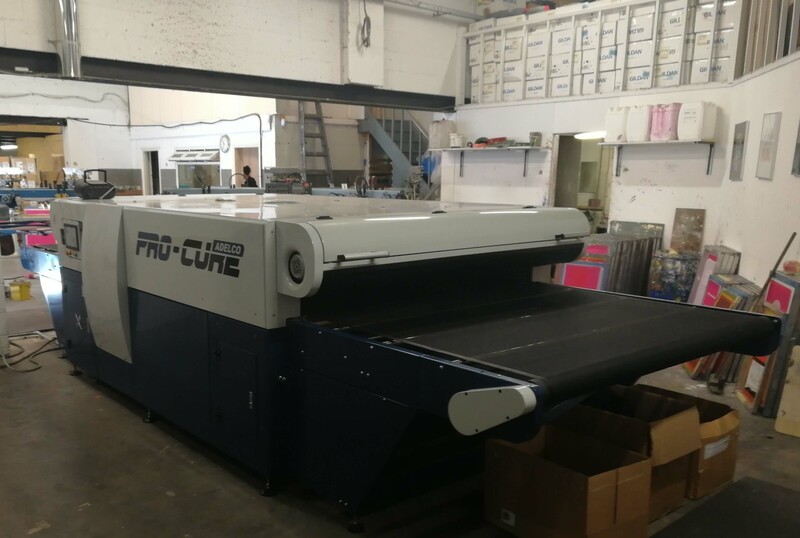 This week we said goodbye to our old industrial Adelco screenprinting dryer and welcomed into our screenprinting family a new, fancy cure pro dryer of the same brand, which has a lot more bang than its prehistoric ancestor. Aided by the great forklift navigational skills of the boss, the new dryer arrived to its resting place on the printing floor safe and sound . The new screen printng dryer arrives in one piece, just about. 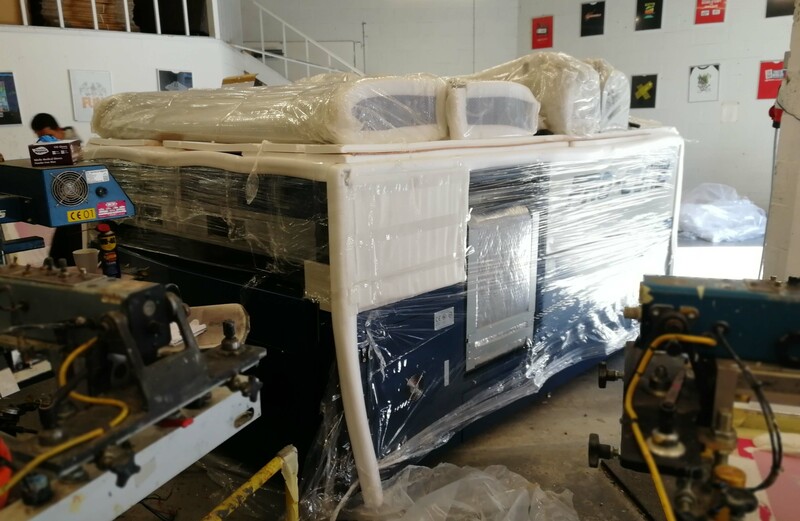 An essential piece of screenprinting equipment, the Adelco dryer not only dries the printed Tshirts but it also has the added ability to cook frozen pizzas for its hungry operators. We have our dryers running for ten hours a day so it's fair to say that our new recruit will get a see to a decent bit of action considering we expect it to last for 30 years. This hunk of mechanical mastery has double the drying capacity but yet is far more energy efficient than its predecessor and it's far easier on the eye too (The old one looked like it had served forty years in a Venezuelan prison). Fare thee well old dryer, you have dried your last screenprint, in this life anyhow. It is with a heavy heart that we bid farewell to this old dear. Adopted ten years ago from a broken home, it was clear from her external appearance that she had been through a mental and physical ordeal. But with the right amount of love, care and encouragement the old Adelco dryer was nursed back to health to live out its last ten years as a loyal, if not always dependable or reliable, faithful staff member of the Tshirt Company. But alas, it is off to the scrap heap for her now and we must power on with our new and improved model. Goodbye original Adelco, it is off to the great T-shirt printing company in the sky for you, where you won't be judged by your battered appearance or patchy heat emittance.